A reading from the gospel of Matthew 28:1-15. Listen for God’s word to us. If you are here today, you likely have heard this story. What happens when Sabbath rest is over and the followers of a brutally crucified man go to be with his body. Few of us have experienced a week quite like theirs. Those who loved this great teacher, those who followed and took hope from all the words he spoke, those who had seen miraculous things taking place in others and in their very own bodies. Those who gathered at a festive meal just a few nights early though they did not understand it would be his last. Those who had the courage to watch what would be done to him and those who scattered in fear as soon as the guard came to Gethsemane to take him away. All of those whose hearts were crushed when the nails ripped through his flesh and at last the sword pierced his side showing all the world he was, in fact, dead. A handful of those lovers of that One cannot bear it any longer. The morning after Sabbath rest is over, they go to see the tomb. Certainly you’ve heard the story before, though perhaps you’re not familiar with the details unique to the perspectives of the four different authors of the gospels who record the happenings as they had come to know it. It’s the gospel of John, the latest of our recorded gospels that tells of Mary Magdalene heading off to the tomb alone. Only to return with news something was amiss, which set off the apostles Peter and John in a foot race to see for themselves just what was going on. It’s the gospels of Mark and Luke that have a group of women early the morning after Sabbath, taking spices to the tomb to properly tend the broken body of their beloved Lord. Mark names the women from the start: Mary Magdalene, Mary the mother of James, and Salome; though Luke leaves out that specific detail until the end of the story when the group is named as Mary Magdalene, Joanna, Mary the mother of James, and the other women too. It’s Mark in which the women wonder together who will roll away the stone for them – as if they hadn’t laid out their anointing plan all that very well. All the gospels tell of some sort of angelic being – either one or two come to deliver an important message to the woman or women, depending on the version of the story. In Mark the women flee from the tomb and find themselves too amazed to tell anyone. In Luke, the apostles believe the women’s words to be an idle tale. John and Matthew include an appearance of the Risen Christ come to meet Mary Magdalene as it’s told in the gospel of John, and Mary Magdalene and the other Mary too as it’s told in the gospel of Matthew. And it’s Matthew alone that makes mention of an opposition party at the tomb. The guards. Stationed there at the pleading of the religious leaders; for they were worried the disciples might try something tricky like stealing away the body after three days in order to deceive everyone that he had been raised from the dead. According to Matthew chapter 27, Pilate grants the wish. Guards are stationed in the graveyard and the stone of the tomb is sealed extra tight so the living cannot get in and the dead cannot get out. The gospel of Matthew alone is also the one that tries to explain what happens. How the earth itself shook and a mighty angel of the LORD descended to roll back the stone with ease before hopping up on it in victory to sit in all God’s glory. Supposedly it all took place right after Mary Magdalene and the other Mary arrived at the tomb – before their very eyes and those of the guard’s as well. Which leaves us wondering if it ever would have happened had not at least these two followers believed God yet could make the impossible possible. Matthew doesn’t include a mention of women and spices and the duty of an early morning anointing of a beloved one’s dead body. He simply states: “After the Sabbath, as the first day of the week was dawning, Mary Magdalene and the other Mary went to see the tomb” (Mt. 28:1). Could it be they believed and had to see for themselves what their Lord had been telling them all along? . . . It’s the contrast lifted up by the gospel of Matthew. As if in these characters of Mary Magdalene, Mary, and the guards of the religious leaders; we see the energies that war within us all. The parts of us that hope and the parts of us that fear. The parts of us that dry up like dead men, as the guards do in terror; and the parts of us that hold on to experience the absolutely amazing, as the women do when they nearly knock over the Risen Christ on their excited dash to deliver the incredible news. It leaves us wondering what role we have to play in God’s resurrecting work. Are we, as the gospel of Matthew seems to portray, necessary participants in the process? So that the stirrings in us that something incredible yet can take place are exactly what is needed for new life to have a shot. A prayer simply titled Common Prayer, could be the summary of the gospel of Matthew’s telling of resurrection possibility. It goes like this: “There are only two feelings. Love and fear. There are only two languages. Love and fear. There are only two activities. Love and fear. There are only two motives, two procedures, two frameworks, two results. Love and fear. Love and fear. Love and fear” (Common Prayer, by Leunig. Quoted in books and speeches by Alan Jones). According to the gospel of Matthew, there are two energies at the tomb that morning after Sabbath after fear had worked its mighty magic. The earthquake, the flash of some mystical messenger, the site of an empty tomb. Does it leave us shaking in fear? For if this thing which defies human logic actually could be – this Life after death thing really something within the Divine’s reach – then what does it mean for us? For our dying, even before our physical death; in order to truly Live. . . . And if this dying, even before our physical death; in order to truly Live is the Way as shown here in full in Christ; then . . . wow! We indeed have absolutely nothing to fear. . . . With the women, we’re left to fall down in worship before this One. To open wide our hearts in overflowing love; for the Way of the Living God. For there are only two feelings. Two motives. Two activities. Two results. . . . Because of Easter morning, which one will you choose? This entry was posted in Sermons and tagged 16 April 2017 sermon, Common Prayer by Leunig, Dying before death, Easter, Easter Sunday Sermon, Life, Life after Death, Love and Fear, Mary Magdalene, Matthew 28:1-15, Opposing Energies in Us, Resurrection Possibilities on April 17, 2017 by RevJule. This entry was posted in Sermons and tagged 27 March 2016 sermon, Cynthia Bourgeault, Easter Sunrise Sermon, God is Still Speaking, Mary Magdalene, Resurrection, The Resurrection of Christ on June 27, 2016 by RevJule. Last year on a trip to the monastery our retreat series heads to at the end of the month, I picked up a cute little icon in the bookstore gift shop. The icon features slender figures. A bit dark-skinned, with angled faces. One figure in the icon appears to be dressed differently than all the other figures who collectively appear through an opening in a wall with a majestic skyline in the background. Eleven sets of eyes peer at that figure who is dressed differently – in red that covers from head to toe this one who is the tallest figure in the icon. A finger is raised – as if in mid-sentence – and the eleven other figures look on at this one who obviously is talking. Interestingly, the figure at the lead of the pack is stern-faced and holding up a hand as if to indicate no. At the top of the icon, above the people, above that opening in that wall, a rainbow arcs over all. . . . The point of an icon is to tell the story in picture form – initially the form used to pass on the gospel in a world where few were able to read and write. Today, we have the privilege of knowing the names of icons, in case our eyes can’t read the truth the icon creator intended when they wrote the picture. By the way, icons are written, not drawn, though all they typically are is a scene of something in our faith. It’s an elaborate, deliberate process to proclaim a very intentional message. . . . And can you guess the message of this little icon? The eleven in the opening of the wall would be: the Risen Christ’s disciples. The rainbow tells us it’s the advent of a special new day – all creation knows it. The tallest figure in red outside the wall to whom every eye instantly is drawn is Mary Magdalene. The sentence she’s obviously in the middle of saying is: He is risen! Christ is risen indeed! On the back, the icon is entitled: Mary Magdalene Announces the Resurrection. I’m not sure we think enough about those first disciples during the season of Lent. That is until the dramatic events of the Last Supper where Christ washed the feet of them all and gave the command that they love one another as he loves us. But what about Mary Magdalene and all the others a few weeks prior to that fateful night? Three Sundays before Easter, where were they and how had their lives already been changed? History hasn’t always been pretty to this Mary of the New Testament who is believed to be from Magdala – so, often referred to by us, as Mary Magdalene. The gospel of Luke is the only gospel to make mention of Mary Magdalene before we get to the events of Holy Week and Easter morning. Luke alone states in chapter 8, verse one: “Jesus went on through cities and villages bringing good news of the kingdom of God. The twelve were with him, as well as some women who had been cured of evils spirits and infirmities: Mary, called Magdalene, from whom seven demons had gone out, and Joanna, the wife of Herod’s steward Chuza, and Susanna, and many others, who provided for them out of their resources” (Luke 8:1b-3). As Mary is the first person named in Luke chapter 8, and as this portion of scripture directly follows the time when Jesus forgave, at the home of a Pharisee, a woman of the city who was named a sinner – though the text never says what her sins were; somehow a Sixth Century Pope took all that, mushed it together, didn’t quite read the text closely enough, and labeled Mary Magdalene – well, you know what they call women of the city who are sinners (prostitutes). . . . For whatever reason, Pope St. Gregory the Great started telling a particular tale of her that ended up sticking pretty well (The Wisdom Jesus, Cynthia Bourgeault, 2008, p. 81). No evidence exists – even in the New Testament writings to draw such racy conclusions about what kind of a woman Mary Magdalene was. If we trust the writer of the gospel of Luke’s account of Mary Magdalene, then we know her as one who presumably Jesus has healed of whatever spirits held her captive – the text doesn’t even make those details very clear. What all four of the gospels do consistently tell us of Mary Magdalene, and her alone, is that she is the only one with Jesus through every step of the crucifixion, burial, empty tomb, and, as my icon accurately tells of the gospel’s record: Mary Magdalene not only is the first to whom the risen Christ appears, she is the first to go blurt out to all the rest who are hiding out in fear that she has seen the Lord! He is risen! He is risen indeed! The Nag Hammadi scrolls which were unearthed in the Egyptian desert in the 1940s include manuscripts believed to be written by Mary Magdalen herself – or at least recording her perspective of the trek with Jesus all over Palestine, to that last week in Jerusalem, and beyond (Ibid., p. 1, 22). The New Testament, in addition to these recently unearthed treasures, makes it clear that whatever Mary of Magdala saw in this Jesus called the Christ, whatever she experienced in her life because of him: from the first day meeting him on, her life never ever would be the same. She became a new creation. A sought after voice for believers in the early days after the resurrection, though the manuscripts that were unearthed in the 1940s tell of one or two run-ins with Jesus’ other follower Peter throughout the years their paths crossed. One author writes of that first encounter of the Risen Christ on Easter morn: that it is “a powerful moment of pure love” (Ibid., p. 85). In her distress from witnessing with her own eyes the entire Holy Week drama, Mary Magdalene goes and does what those who most love a dying person would do. She stays by his side every step of the way. Even weeping at an empty tomb, she demands to know where her beloved Lord’s body has been taken. When at last he speaks her name, and I quote again that same scholar: “she recognizes him and throws herself at his feet with an ecstatic cry . . . Easter Sunday begins with the energy of this encounter; it reverberates with two hearts reunited” (Ibid.). Nothing in her ever would be the same again. She was a new creation. They all were. What of Peter and James and John? What of little known to us Thomas, who I once was schooled about by a member of a church I served. She was a devote Christian woman from India who proudly explain to me that her family lineage traced all the way back to the Apostle Thomas himself, as is common in many of the Christians in the land to which Thomas took the good news just a few decades after Christ’s resurrection. If I was taught that in all my years of school, I hadn’t remembered the trajectory of Thomas’ mission outside of the Roman Empire all the way to India. When I did a little fact checking, I found it indeed to be so. If you’ve been to Italy, perhaps you’ve visited the chapel in his honor that contains relics from him that were found in India (www.gcatholic.org/churches/Italy/0164.htm). Or if you’ve been to India, perhaps you’ve visited the Basilica of the National Shrine of St. Thomas, were one of the three known tombs of Christ’s first apostles still exists – that of Thomas, of course. Peter’s being in Rome and the tomb of the Apostle James being in Spain (www.velankanni.in/stthomas.html). All of them were entirely NEW CREATIONS! They met Christ, they followed him, they learned from him, they grew to love him more and more each day, and their lives NEVER, EVER were the same again. I think that’s what Paul, in his second letter to the Christians in Corinth, was trying to say. “So if anyone is in Christ,” he writes “there is a new creation: everything old has passed away” (2 Cor. 5:17). Our love for him – Christ’s love for us really – changes us. How else would anyone of us even know each other? Why else would the path of our lives lead us to wherever your path as a follower of his has led you? Do you think you would deliver meals on wheels in this neighborhood if you never had heard of the gracious love of God, who in Christ was reconciling the world – seeing us as beloved, scot-free sinners to whom God has entrusted the very same message that God was about in our flesh and blood as Christ Jesus our Savior and Lord. Listen to what Paul writes in that beautiful text about us: not counting trespasses against any, but entrusting the message of reconciliation to us, so that we now are ambassadors in this world for Christ! (paraphrase of 2 Cor. 5:19-20a). NEW CREATIONS! Every last one of us. Because of him we love the children who come to us on Wednesday nights. We open this building to be a place of communion, healing, and growth for an eclectic array of people from beyond this church who come here as if it too is their home. We feed those who come here hungry. Through your Good Samaritan ministry, you ensure families have heat and senior adults have water to clean and bathe themselves. You love and care for one another and you go into the everyday places of your homes, neighborhoods, and professional lives to live differently because Christ has made you a new creation! . . . I love that those first followers of him come to us in this season of Lent and I don’t know, like me, don’t you want to know more about the wild and crazy turns of their lives because they met and followed and learned from and loved Christ Jesus our Lord? Don’t you want to know their absolute determination, their unstoppable courage, their amazing ingenuity to navigate the waters of whatever culture they eventually found themselves in? I mean, India had to be VERY different from Palestine in the First Century – an exotic land so far away from the place where Jesus lived and died and lived again. Spain was like a land no one ever had heard of back then? What did James do to learn the lingo of the people he met there so that they too would come to know the life-changing love of Christ? We know he did because some of the oldest monasteries in this world began in Spain thanks to James’ efforts. And Peter? He didn’t care if he had to stand before the Holy Roman Emperor himself (which he supposedly did). He was going to find a way to pass on the good news of God’s unending love for us all as we know in Christ. . . . And you know, I just wonder. If they could do it; all those years ago. In a world that seemed absolutely foreign to them, among people who most probably seemed so incredibly different from them; then what about us? Why can’t we? . . . Why can’t we? HPC: each and every one of us are NEW CREATIONS. We can leave behind the old and continue to forge a future as ambassadors for Christ some-20 centuries after folks first began it. Because it’s God’s work in those who follow and love and continue to learn from the One who revealed the heights and depths and lengths of God’s love for this whole world. We have in our DNA all we need to become what God needs us to be individually and collectively, today and tomorrow, for this community right here in the world around this building where we all come to worship each week. We can do it; for in us, God has made a new creation to be about God’s work right here and right now! . . . I know it’s still Lent, but that good news makes me want to shout already: Alleluia! Alleluia! Alleluia! And Amen! This entry was posted in Sermons and tagged 2 Cor. 5.16-21 sermon, 6 March 2016 sermon, Icons, James, Mary Magdalene, New Creation, Peter, Thomas on March 8, 2016 by RevJule. Early in the day standing in the garden just outside the old city of Jerusalem, it is easy to imagine this morning. The world is hushed as the sunlight streams through the tree branches. All kinds of birds gloriously sing. Little flowers open their petals as if to proclaim their own alleluias. Of course, it’s impossible to be there alone these days what with the millions of pilgrims who make the trek to the Holy Land each year. The good news is that this treasure of the Garden Tomb is less crowded than the Church of the Holy Sepulcher inside the old city walls where Roman Catholic and Eastern Orthodox Christians have built a massive structure over what they claim to be the sites. Not so in the garden – there’s none of that holy bling there. Just an authentic sense of a quiet spot only a stone’s throw from a rocky hill that literally looks like the shape of a human skull. Archeologists claim that was the site, the Place of the Skull, where Rome would have crucified insurrectionist as it was along a main thoroughfare out of the city and right over the spot previously used for religious stonings. “’Do not be alarmed; you are looking for Jesus of Nazareth, who was crucified. He has been raised; he is not here! 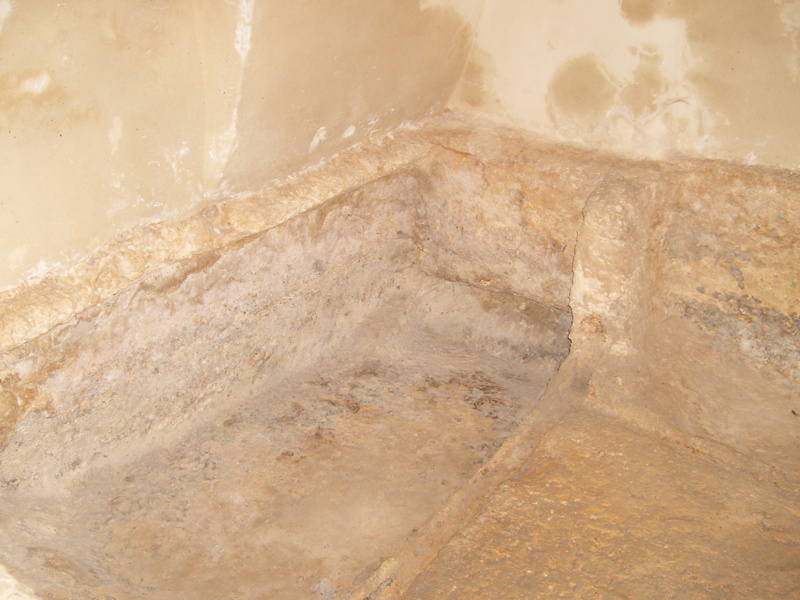 Look, there is the place they laid him.’” (Mark 16:6) The Empty Tomb of Christ at The Garden Tomb, Jerusalem. Photo by JMN, March 2014. The day I was there last year with my pilgrim group, the garden was just beginning to bloom as the sun pierced the crisp morning air. I wandered around the garden trying to catch a glimpse of the Risen Christ standing among the fronds of palm trees or sitting among the greenery of what I think were eucalyptus bushes. . . . According to the gospel of John, Mary Magdalene slipped out of the Upper Room before dawn that first day after the Passover Sabbath was over. Presumably overwhelmed yet with grief, can you see her fumbling her in way in the dark along a narrow path. Down the steps near Caiaphas’s house where Jesus would have been held the long night before his crucifixion. Through Zion’s Gate and all the way from the southwest side of the city to just north of the Damascus Gate. Winding west of the Temple mount across the very same path today called the Via Dolorosa where they would have made him carry the heavy beam for his cross. It must have been a risky trek what with the city all a buzz from the swift action of Rome at the urgings of the religious leaders. The gospel of John doesn’t explain why Mary of Magdala went to the tomb early on that next day, as some of the other gospels tell of spices to be bought for a proper burial anointing. John just says she went. She certainly got in a good workout that morning as she ran back to find Peter and another disciple before racing once again to the empty tomb. Peter and the other disciple are going to be the ones to go in first, into this cave in a garden very near to where their Teacher had been brutally killed by the state just a handful of hours before. The gospel of John makes a big deal about them seeing the linen cloth that had been wrapped around Jesus’ broken body at his burial. The cloth for his face even receives special mention, as if to note that no one would have raided the tomb to take away a dead body but stopped first to neatly roll up the cloth from his head and carefully place it alone in the tomb where his skull might have laid. No, the gospel wants us to know that his dead body hadn’t been stolen. Something miraculous had taken place. Like lying there in the absolute silence of death, when suddenly the breath of God returned to his lungs. Infused again in every cell with the force of life, almost how the buds of tree branches arouse from their winter’s sleep at the first hint of the warming spring sun. He found himself to be alive again and whether he unbound himself or if God made it happen some other way, it was like that day Jesus proclaimed about Lazarus: “Unbind him and let him go!” (John 11:44). Again in the wee hours before that dawn, he stood up. I know it’s a tale many minds find difficult to fathom. You might too if in your day to day life you’ve not experienced such resurrection – such moments after the blows of life when you find yourself somehow, miraculously, again standing up. Maybe that’s why the gospel of John gives so much attention to the lingering Mary Magdalene. Peter and the other disciple are reported as leaving pretty quickly after they went into the empty tomb. But Mary of Magdala stood there weeping in the garden. If in fact it was the exact spot, then right there near the same spot I stood to take the photo of the tomb that is on the bulletin cover for today. We don’t know why she wept – if they were tears of anger. Tears of sorrow. Perhaps even tears with a hint of hope, wanting to be filled with great joy. When pressed on it, she simply says: “They have taken away my Lord, and I do not know where they have laid him” (John 20:13). When she turns to see who she believes to be the gardener, she makes the outlandish statement that if he knows where the body is, then just tell her and on the adrenaline in her own body, she’ll carry him away alone. Oh Mary! The Risen Christ must have been a little bit tickled at her impossible, impassioned plan. I wish we would been told if he giggled at her first before he finally spoke her name: “Mary!” Then, as suddenly as the Breath of Life must have returned to his body, joy flooded over hers. “My Teacher!” she exclaims. For even here in this empty tomb he is showing her the truth he’s been trying to tell them all along the way. It doesn’t make rational sense – our logical minds can’t figure it all out. Which really is part of the gift. For in the world all around us, in those we love, and even in ourselves; Life happens again. It’s the underlying truth of it all for us simply to behold. To see. To trust. To wash over any doubt within until we’re left in total awe. The mystery of a Love that never will let death be the final word. Only Life. Life. Wonderful new Life. . . . In gratitude for such an amazing gift, from Mary Magdalene’s first thanksgiving through all the ages and even unto our own; let us join in the long line of great rejoicing. Christ is risen! Alleluia, Alleluia, Amen! 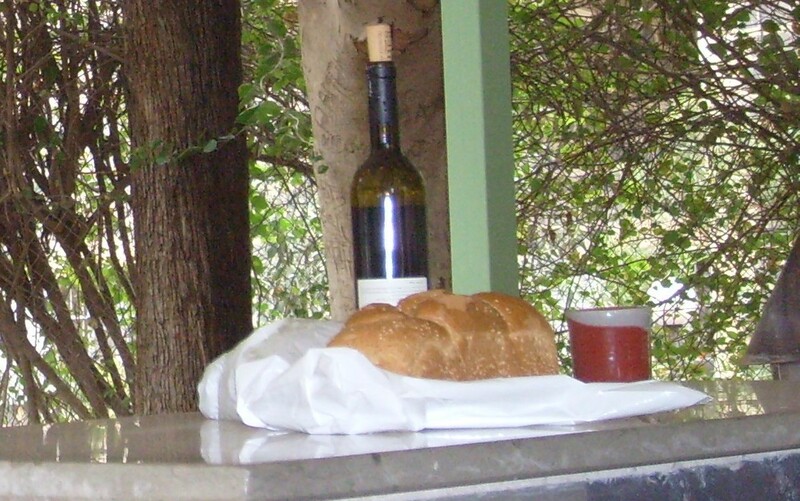 This entry was posted in Sermons and tagged 5 April 2015 sermon, Easter Morning, Easter Sunrise Sermon, John 20:1-18 sermon, Mary Magdalene, The Empty Tomb, The Garden Tomb on April 15, 2015 by RevJule.